So it was a big change for us when our children started school here in Australia and we were told we had to send our children to school with their own packed lunch every day. It added a whole new element of work each morning before school, not to mention the planning that goes into grocery shopping and meal making. 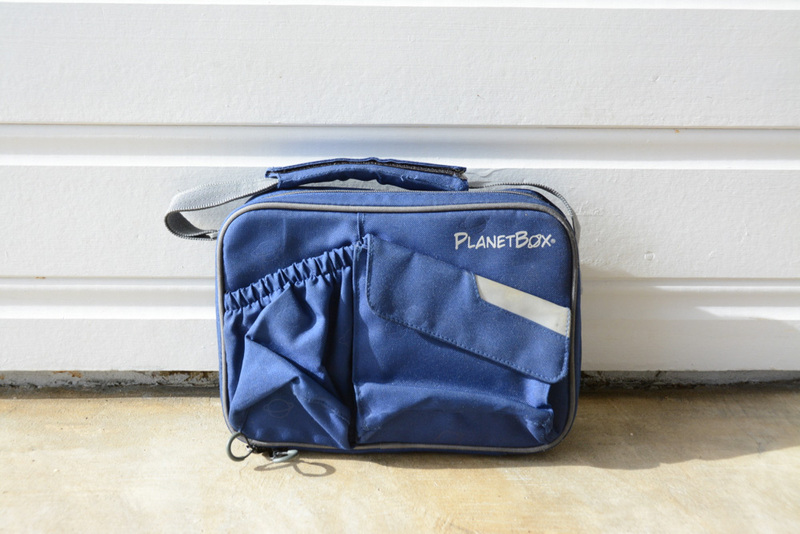 This past January, at the start of the school year, we set out to find the perfect lunch boxes when a friend told me about the PlanetBox stainless steel lunch boxes. What appealed to us the most about these lunch boxes, apart from the fact they’re sturdy, stainless steel and dishwasher safe, is that they have individual compartments which eliminate the need for extra packaging or plastic. No need for plastic baggies, no need for cling film around sandwiches, etc. We also got the insulated carry bag for each of their lunch boxes because it keeps their lunches cool, which was especially important during the super hot summer months here in Australia. Michael has taken his job of school-lunch-maker very seriously, and after some trial and error (is there anything more frustrating than getting your child’s lunch box back full?!!) we’ve managed to find a good rotation of lunches the kids really love. Some of their favourites are: Vietnamese summer rolls (which admittedly take a bit of time and prep in the morning, but the kids LOVE them), pasta salad, cheese sandwiches with chutney dip, a mini tuna can with good bread and pickles, falafel balls with hummus dip, cold frittata (cooked the night before), and any left-over dinner options we have in the fridge (pasta, lasagna, pizza, etc.). 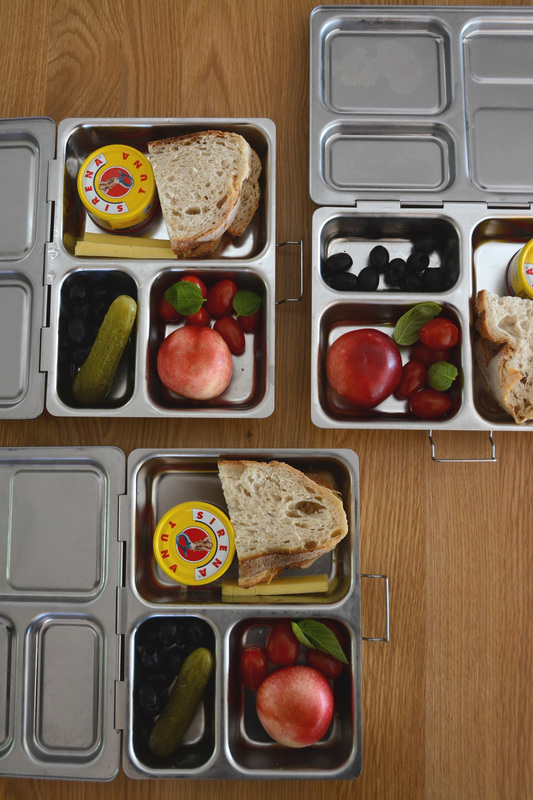 We’d love to hear what sort of things you put in your kids’ lunch boxes! Please do share. My son really loves quesadillas in his lunch. It seems a little strange to me as a cooled off quesadilla doesn’t sound great, but he loves them! Sausage, cheese and crackers is another easy favorite. Almost $90 for a lunchbox?!? Gracious. Several options exist for the elimination of cling film and baggies. But, this seems incredibly extravagant. 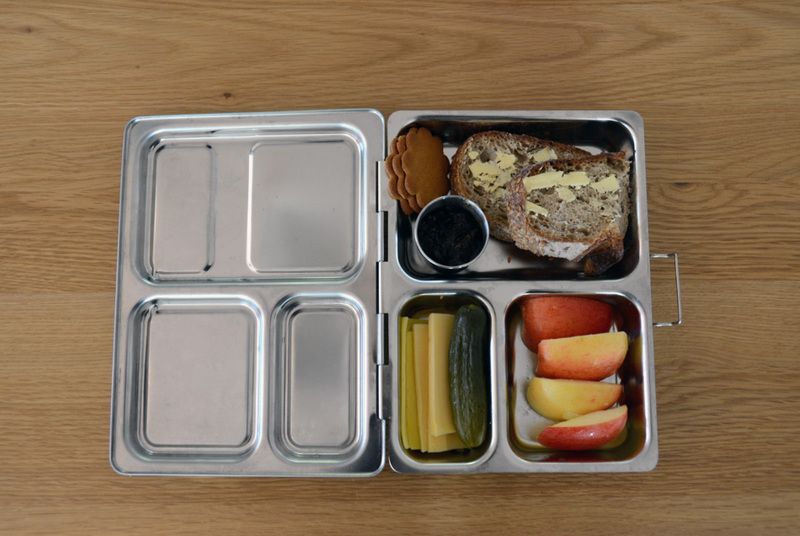 We like the stainless steel ones by LunchBots which are a little more affordable and have several different sizes and compartment configurations. My daughter loves mini muffins (I make them with spinach or sweet potato or roasted squash mixed in and freeze them). I also make homemade energy balls in a big batch occasionally and freeze them. I do lots of mixed lunches with different things in each of 4 sections: a small sandwich, mini muffins, crackers and cheese, cherry tomatoes, cucumber, red pepper, or carrot sticks, leftovers like pasta salad, little meatballs, hummus or yoghurt in a little leak proof pot, nuts and raisins, berries, olives and pickles. Sometimes I will put in cereal in a section with coconut flakes and dried cranberries. 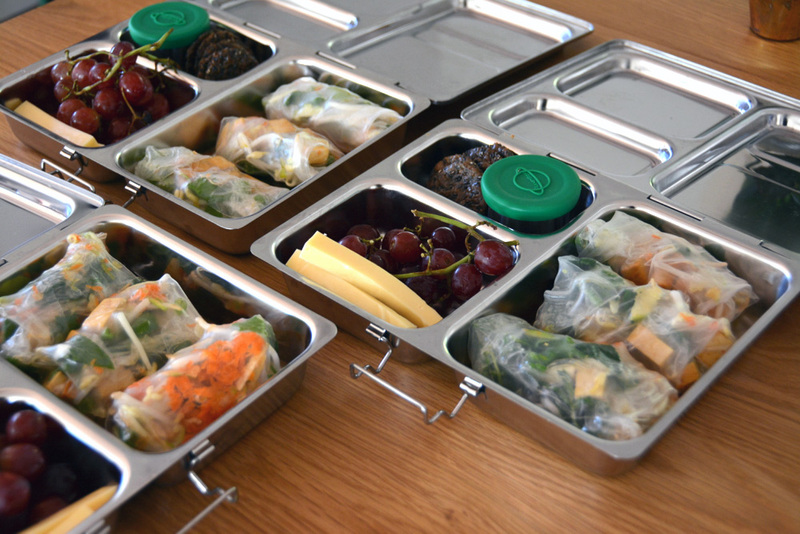 For us, a “dim sum” type lunchbox with a variety of small bites is much more likely to be fully eaten than a single sandwich type lunch (which is the norm here in Holland). I find it easiest to make lunch the night before and have it ready in the fridge for morning. Having a few bits prepped to grab like stuff in the freezer or a stash of sliced veggies makes it quite quick. Meg, they are not cheap but definitely worth the money. Our PlanetBox is 6 years old and still looks like new, and my son is not kind to his things. If you sign up for updates they have sales few times a year (for Earth day was 22%off). We have LunchBots too but rarely use it. This is a super post thank you so much for the fresh ideas. Michael looks like a super chef! Do you have any lunch ideas for adults at home with babies? It is hard when you get stuck in a rut with it all but want to still keep things interesting. Love following all the new addition snaps – has made me excited for our little boy arriving in July. Thanks for your sweet comment. How exciting – a baby boy arriving soon! Yum yum …. I have lunch bots Ans I like it too for same reason – only thing is a bit shallow – I can’t fit a plum in or other foods I can’t think of . tht little tuna cartons above are so handy -except my kids do my eat tuna ! Sliced up carrot / cucumber r / apple and brown bread toasted with butter melted ( cold when he eats it ) is a staple ….. oh ans banana bread – there are some good recipes with little sugar . Is this sponsored, or did you spend 400 bucks on lunchboxes for your kids? This post is not sponsored. I would have mentioned if it was, as we always do. When seeking lunch boxes for the kids, we wanted the very best quality ones so we wouldn’t have to replace them. (With five kids, I’ve learned that if I’m going to buy something, I should buy the best quality so it lasts and I can pass it down.) I have a few friends who use these lunch boxes so they were highly recommended to us. We’ve used other types of bento-box-style lunch boxes that weren’t as good of quality. For example, the lids on some of the other ones we’ve tried would occasionally pop off. We liked these ones because they stay closed, are easy to wash, and just generally work really well. Very much agree with Meg, and would also like to know the answer to Helena’s question. Can’t believe this is considered the only/best way to avoid waste. Please, ladies – a bit more creativity and common sense! Yep $90 is insane for a lunch box and what happens when they get lost!? You have not included the most common lunch of them all here… a vegemite sandwich!! Sandwiches, rolls and wraps are the most popular in our household. I wake up many morning to the smell of bacon as my secondary schooler is up early and loves to pack himself a BLT! The biscuits are the Anna’s Swedish Thins: https://en.wikipedia.org/wiki/Anna's_Swedish_Thins. We love them in our house. We don’t put biscuits in their lunch very often, but occasionally we put a couple of these in for a little surprise. After a year of fiddling around with 3-4 separate tupperwares per lunch box and endlessly searching for lids every morning, I plan to invest in these for the next school year. I find it so hard not to make PBJs every day as they are the only sandwiches that get eaten. 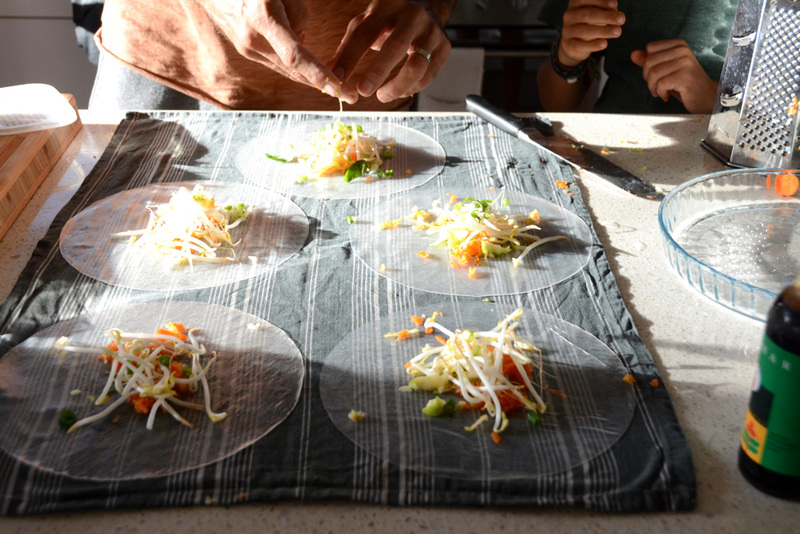 Perhaps I’ll try and introduce these delicious looking summer rolls. Another great brand for those wanting something cheaper is Goodbyn. Ours are almost 2 years old and are still going strong. They are plastic but have nice deep sections and you can get smaller containers to fit inside. Starting at $20 I think. I can see where some of the other comments have come from but if someone chooses to spend $360 on something that’s used 5 days a week and 50 weeks of the year then that’s their choice. You may find value in other things but the point is, Planet Box are built to last. To each their own! Love this post! I’ve been looking for a lunch carry box (for myself, ha!) like this with no avail! Do you mind sharing what version this is? Thanks for the ideas.. I love seeing what other parents put in their kids lunchboxes! Can you do a post about what you feed your family for dinner? I’m so uninspired when it comes to family dinners. My kids are a wee bit fussy when it comes to unfamiliar food but in general they are pretty good eaters. It’s important we eat together as a family but sometimes I struggle with quick and easy family friendly food. so late commenting ….but its going back to school time…I’ve looked up planet box on your reccomendation – was going to try it. My eldest is 7 – is the launch very big ? It seems that it is for adults and big kids – but then it looks like your girls use the launch planet box too? I currently have a lunchbots bento box which we have used for over a year and will continue to be used by us but sometimes we can’t fit bigger fruit in etc. also thanks for talking about lunches – I don’t know any mothers/ dads that aren’t looking for new ideas for the lunch box!